The company's claim was based on the Lanham Act, which prohibits unfair competition and false advertising. "This is about protecting our reputation," Jim Johnson, P&G's chief legal officer, said in a statement Monday. "We will take appropriate legal measures when competitors unfairly undermine the reputation of our brands or our company." The former Amway distributors thought they'd be exonerated and were shocked by the jury's verdict late Friday, said Randy L. Haugen, one of the defendants. "It's hard to imagine they'd pursue it this long, especially after all the retractions we put out," said Haugen, a 53-year-old Ogden, Utah, businessman who maintained P&G was never able to show how it was harmed by the rumors. "We are stunned. All of us." Haugen said he forwarded another person's account of the Satanic rumor to other Amway salesmen on a common phone-message system, then circulated the retraction. The original message, however, found its way to Procter & Gamble. Amway has said it acted quickly to quash the rumor and the company was dismissed from the case, leaving the four ex-distributors, who are protected by liability insurance against the judgment, Haugen said. P&G spokesman Terry Loftus said Monday that the corporation brought a handful of cases against various individuals — not just Amway distributors — through the 1980s, with the last one prior to this case filed in 1990. Loftus said he did not have immediate information on the outcome of those cases. Joseph Joyce, one of the attorneys representing the Amway distributors, didn't return several messages left by The Associated Press on Monday at his Salt Lake City office. A federal judge had dismissed the lawsuit involving Amway, and a three-judge panel of the U.S. Circuit Court of Appeals in Denver agreed in 2003, saying the rumors were not defamatory and that P&G had not made a case for specific damages. 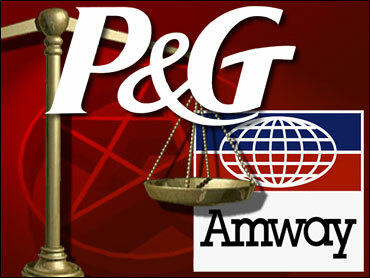 P&G, however, got the case reinstated on a further appeal, Haugen said. Amway has successfully defended itself in this and other lawsuits and can provide its research materials to the former distributors if they appeal, said Kate Makled, spokeswoman for Alticor Inc., Amway's parent company based in Ada, Mich.
"Despite the public apology, P&G has spent 12 years destroying their lives," Makled said. "P&G is a $68 billion company. What they got out of this case was what they could earn in about 2½ hours. We think that's shameful." Amway is involved in direct selling through independent business owners in over 80 countries and territories around the world.